Refashion Co-op: A Silky Solution! A little 90's, a little err.... something! 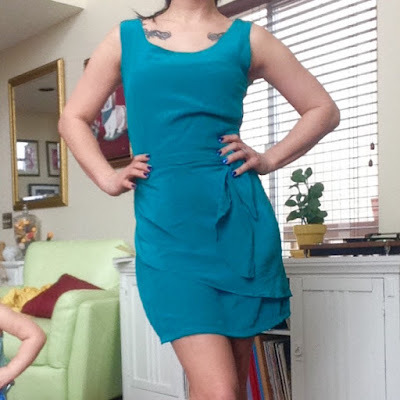 This dress was a lot of work to refashion. I love the results though! I took it in and made it shorter. Then I used the extra fabric to create layers on top of the skirt, and a belt. There are a ton of pictures from the process on my blog post about this dress. Please stop by there to see all the images. I also go into complete detail on how I did everything too! Front! I tie the belt at the side. I love the layers - very nice! Nice refashion and great score at the thrift store.